As we go through the holiday season, we’ll highlight a particular luxury product that we know is a wonderful gift for the wife of many years. 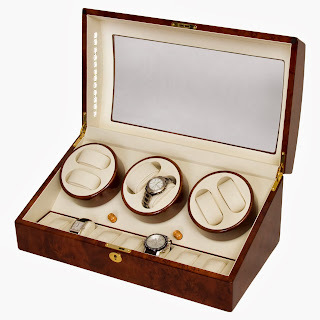 The treasure that we'll discuss is a Standing Jewelry Amoire, which falls under the luxury jewelry box category for three reasons: the size, practicality, and expense. Under the assumption that she does not already own one, here are three reasons why this makes a great gift for the wife of many years. 1. She has accumulated a sizeable jewelry collection, and likely a very diverse collection. She’s received annual jewelry gifts over the years (birthday, anniversary, Christmas, Valentine’s Day), as well as heirloom’s passed on from family members, such as brooches and rings. It’s also likely that she has not gotten rid of any of her jewelry, especially gifts, unless to give away to a daughter or special family member. As the fashions change, she’ll upgrade to stay with the times, but not want to discard pieces that have sentimental value (especially for necklaces and earrings, re: large hoops and heavy chains give way to multiple small earring studs and chokers). After 15 years, it’s reasonable that she’s collected close to 50 separate pieces. 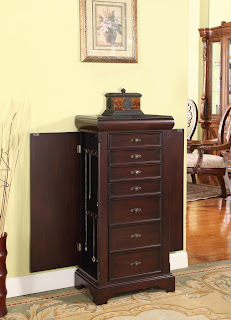 A large jewelry armoire has the space to securely store all of that, and continue to grow. 2. The desire by an attentive husband is to find a gift that is both thoughtful and functional. 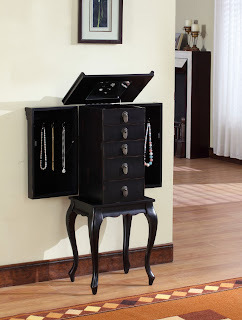 A standing jewelry armoire does both. It is something that she’ll see and appreciate every day. 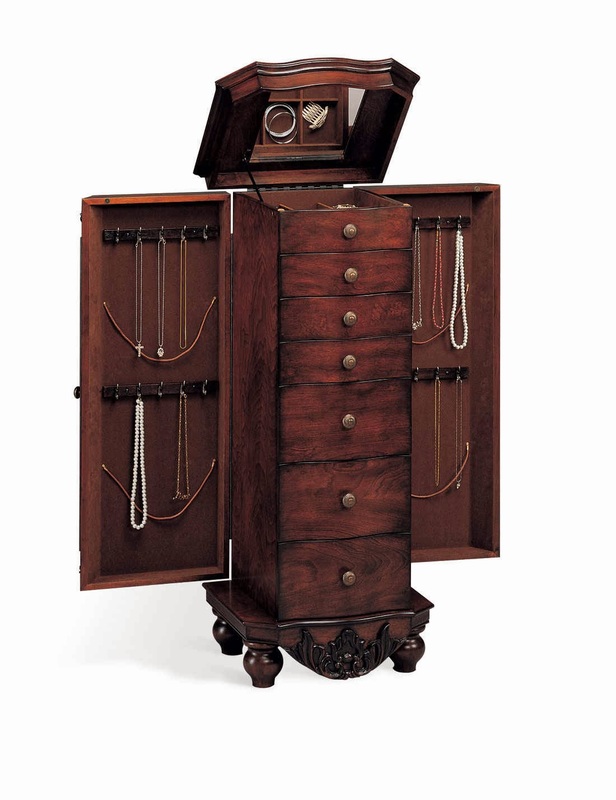 A large jewelry armoire also includes up to 8 drawers, the bottom 5 of which are larger and can hold delicates and undergarments as well as jewelry. 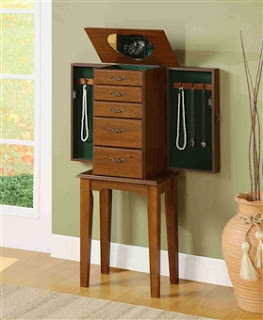 This makes the jewelry box a very practical addition as bedroom furniture too. 3. 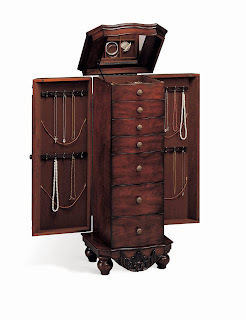 As an established family, a standing jewelry armoire as a luxury gift is truly unique, as they normally cost hundreds of dollars and have a niche purpose: to store large jewelry collections and small clothing pieces. 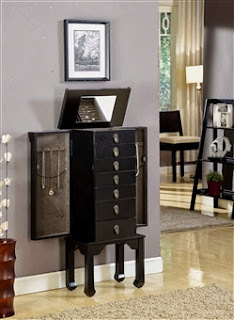 So as a husband who has been married for many years, consider the Jewelry Armoire as the perfect treasure for her! Now that we've talked about leg design, a natural next discussion point is the foot design for standing jewelry armoires. Like the leg styles, foot styles generally fall into antique, traditional, and modern. Antique designs include Arrow, Ball, Block, and Bun. All of these are designs that have withstood the test of time, over centuries, and remain both functional and attractive. Traditional designs include the Bracket, Cylindrical, French, and Ogee Bracket Foot with French and Bracket Foot being two of the more popular. The Pad Foot is a simple design that fits well with Cabriole legs (and are therefore popular foot designs). For standing jewelry cases with no legs, the Onion Foot (and versions of it) as well as the Bracket Foot tend to be the most popular as, like the antique designs mentioned above, they are practical and visually appealing. 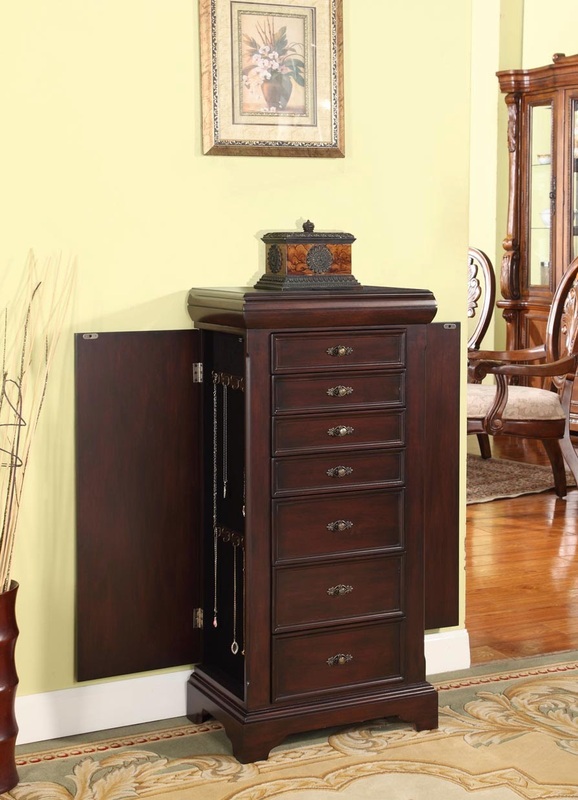 These styles tend to be used in designs such as Heppelwhite, Sheraton, Windsor, Chippendale, and Queen Anne. 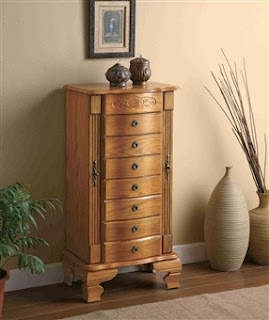 Feet for modern standing jewelry armoires are generally square blocked at the bottom, as the legs are normally straight with little design and, as such, the feet become extensions of the legs. In some cases, the feet are cut to points or notched to provide a visual break between the leg and foot. Animal designs that are rarely seen include the Claw & Ball, Dolphin, Hoof, and Paw. 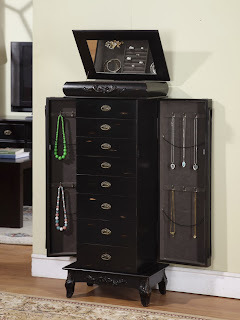 The attraction of any standing jewelry case is going to be a combination of all aspects of the design: feet, legs, drawers, hardware, finish, wood, and wood design. 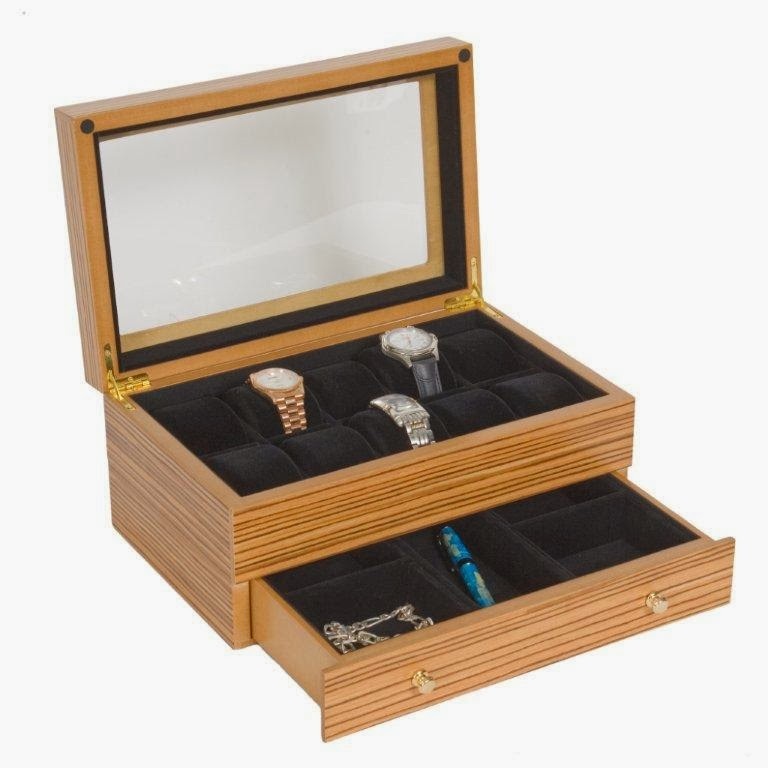 As you shop for a standing jewelry box, the integration of each one of these will create choices that will let you pick the perfect jewelry box for you!